My company uses LDAP for user authentication, so multiple local servers would use the same set of credentials. 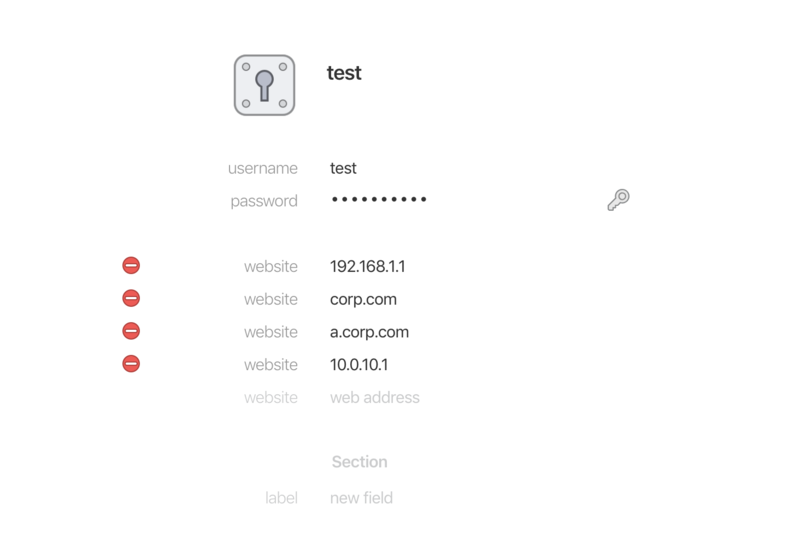 Some servers have dedicated sub-domains (a.corp.com, b.corp.com) and 1Password can correctly recognize second level domain and fills in the data. The problem is with servers that sit on raw ip address, 1P treat them as independent and offers to create a new entry. That won't work as our password policy forces us to update password every three months, so I'll have to go and update it in all the records manually. What I'd like to have is an ability to add synonym urls to the password entry, but I can't find it anywhere. LastPass can do that, are there any plans to add this functionality here? As long as the login form for each isn't too different this tactic should work. Indeed it works! I was very confused by "Sign-In Page" that you can't duplicate and haven't even checked "website" field before. What's the difference between them after all? I would like to know that, too. 1P X sometimes saves as "website" and sometimes as "sign-in-page". So they're all special URL fields underneath but website is the default label for a new field and I'm guessing 1Password X is trying to be helpful by supplying what it believes is a more accurate label for this URL. You are free to change the label to whatever you wish as really the label is for you and I as the user than for 1Password.